On July 21, the Pleasanton Express posted the following on our Facebook page which has 12,800 followers. “Please leave a comment (no cursing please) about your service. The Pleasanton Express has experienced over a week of no service or one bar. It is hurting our productivity and business. When I leave the office, I cannot make calls on my phone.” AT&T was tagged in the post. 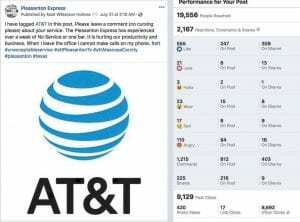 To date, for both AT&T posts the total number of people reached is 19,556, 2,167 reactions and shares, 9,129 post clicks, 1,215 comments. 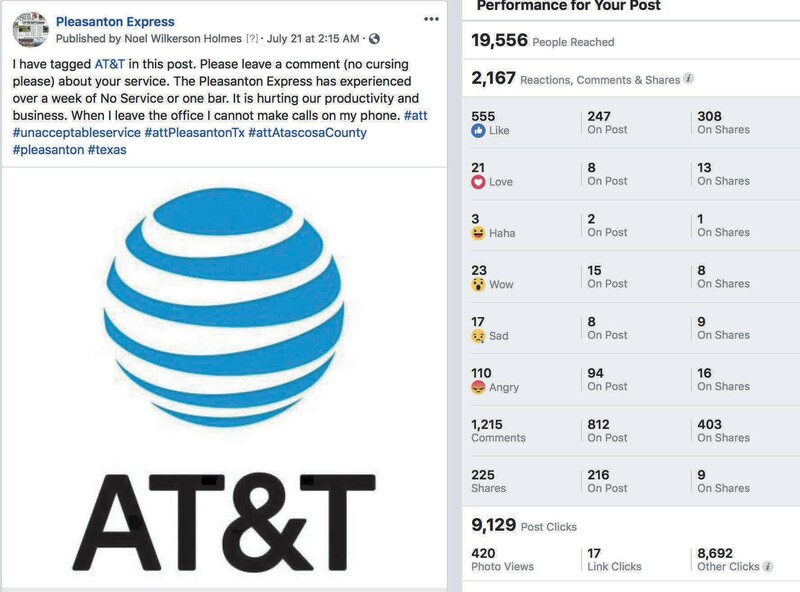 The Pleasanton Express received a call from an AT&T executive engineer on July 22 who said that he saw the 800 comments and would be printing them out for his team to review. He was not a spokesperson for AT&T but was the lead for the team who is responsible for cellular service in South Texas. 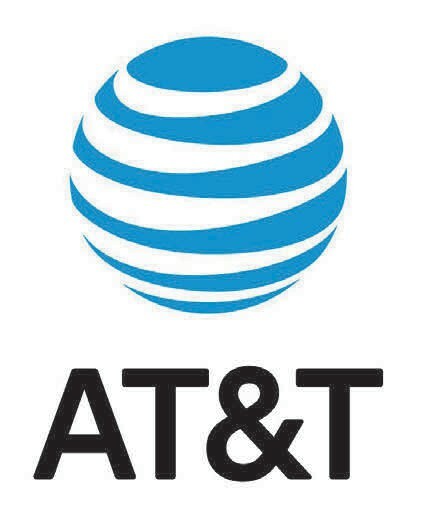 Carlos Ramirez, AT&T Lead Public Relations Manager – South Texas AT&T emailed this statement to the Pleasanton Express on July 26: “We’re always looking for ways to provide a better experience for our customers in the Pleasanton area. We’re currently working to upgrade our network, and plan to make additional improvements in the future. If customers are experiencing issues, we suggest they contact our customer care at 800-331-0500. Ramirez email is Carlos.ramirez.8@att.com. AT&T added to their statement that if customers are experiencing issues indoors, we suggest they activate “Wi-Fi calling” and ensure their phones have “Enhanced LTE Services” turned on. Learn more at www.att.com/ shop/wireless/features/ wifi-calling.html. Please call the customer care number even if you have called before and please email Mr. Ramirez. The Pleasanton Express would appreciate it if a reader does email Ramirez that you would cc: nwilkersonholmes@pleasantonexpress.com on all emails so that we can report on the number of emails sent. Please also message us on our Pleasanton Express Facebook messenger if you place a call to their customer service. Let us know what AT&T said. The Pleasanton Express will be calling the Texas Utility Commission on the advice of a reader who said that is the ultimate authority to report bad service from utility providers. 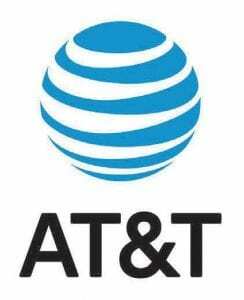 We will be providing a print out of all your comments posted about AT&T from our facebook page. Besides contacting the Texas Utility Commission, the Pleasanton Express will be trying to organize a town hall meeting at a privately held business. We would be glad to use our office as a meeting place but do not feel we are large enough. We plan on contacting the San Antonio and area media to join us in helping to be a voice for the citizens of Atascosa County. In the opinion of the Pleasanton Express, this is more than a financial hardship on individuals and businesses, it is a safety issue for the elderly, the students, the law enforcement, the firemen, the EMS and the oilfield workers, the ranchers, the farmers and every citizen. It is hurting businesses productivity and ability to meet deadlines and work as efficiently as possible in a very competitive marketplace. For comments, please contact Noel Wilkerson Holmes, 830-569-4967, email me at nwilkersonholmes@pleasantonexpress.com or message the Pleasanton Express on Facebook.